After decades of activism, the scales are finally tipping for the figure of ‘Black Pete’ in Dutch winter celebrations. Within a few years’ time, opinion has shifted from an utter failure to understand anti-Pete protests, to attempts at change. But how did the Dutch manage to be blind to the offensiveness of this type for so long? Is Dutch culture perhaps more racist than its progressive reputation suggests? To start with the last question: yes, Dutch society is suffused with racism – as is western culture generally. Yet it is one of the fundamental characteristics of racism that it is perpetrated mostly unawares. Most racism – ‘everyday racism’, in the words of researcher Philomena Essed – takes the shape of casual remarks and unconscious judgments. 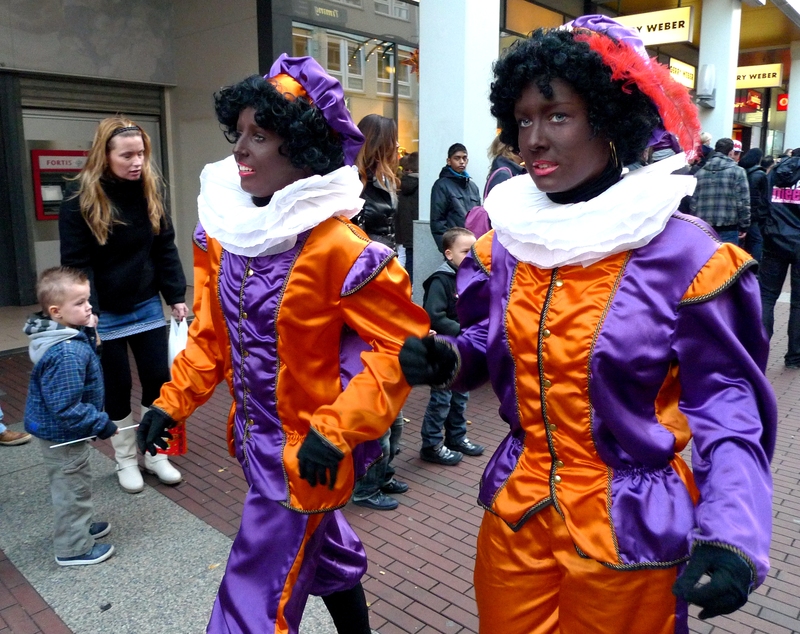 In the Netherlands, one of the forms this everyday racism has taken in the twentieth century is Black Pete: ‘Zwarte Piet’. Black Pete is part and parcel of the feast of Saint Nicholas, the country’s largest annual celebration. It elicits more eager anticipation and mobilises more public and commercial institutions than King’s Day and Liberation Day put together. The festival peaks on 5 December but officially starts halfway November already, and it takes possession of the shops as early as late summer. It is primarily aimed at children, and the memories it inspires are among the fondest childhood memories many (pink people?) have. Black Pete’s position in these celebrations has never been fixed, but in the last few decades he seems to have been fulfilling the role of mediator. During the festivities, which have moral overtones of reward and punishment, it is Pete who mediates between the anxious child and the Godlike figure of Saint Nicholas. Whereas the latter evokes a degree of fear, Pete is approachable and loveable. This explains part of the attachment many Dutch feel towards Pete. 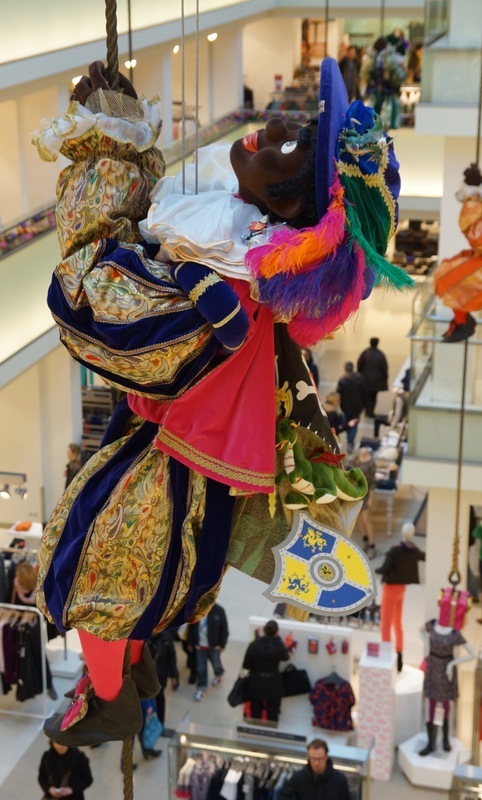 Photo by Nik Morris, ‘Zwarte Piet bij de Bijenkorf, Amsterdam’, 2012 (CC BY-NC-SA 2.0). Clearly, however, depicting Black Pete is no innocent business. The figure has a dual ancestry as both servant to and antagonist of the Saint. In many parts of Europe, Nicholas is accompanied by an anti-Saint or devil, making sure that both reward and punishment remain on the minds of their audiences. Sometimes, this devil carries a chain as a sign of his final submission to the power of good. The chain returns gruesomely in the more recent tradition, beginning in the nineteenth century, that portrays Pete as an African man in the service of a European saint. Although dark servants in the Netherlands were not technically enslaved, slavery did very much exist in the overseas territories of the Dutch empire. It is this history that most activists point to as being silenced by the uncritical acceptance of Pete in his existing shape. This shape is of course that of the ‘Sambo’. Whereas nineteenth-century depictions of Pete still show a ‘neutral’ man of African descent, in the twentieth century Pete merged with the international Sambo caricature, including red lips, golden earrings, and silly behaviour. The endurance of this figure always comes as a shock to Americans or Brits who thought of the Netherlands as a fair and open country. Anti-racism activists in the Netherlands have made grateful use of this cultural disjunction between the anglophone and the germanic world (blacking up also occurs in countries such as Belgium, Germany and Austria) by confronting their compatriots with the judgment of international experts, or even the British vox pop. This approach, coupled with demonstrations and judicial action, seems to be having effect. Although there have been protests since the 1960s, these were never picked up by mainstream media or in national politics on the scale we are seeing now. This year, an unprecedented number of Dutch intellectuals and celebrities spoke out against the stereotype; national politicians have taken a stance; and sellers of seasonal sweets and decorations have deemed it wise to change their marketing strategy. So why has Pete been able to mask as innocent for so long? Apart from the associations with childhood and friendship mentioned above, at least two factors play a role. Lacking a civil rights movement like the one in the US, including subsequent educational reforms, the Dutch have not learnt to recognise the racist Sambo character. But various academic studies have noted a second factor: the cherished Dutch self-image of being an open and fair society. A large part of the Dutch public as well as the political establishment, including initially prime minister Mark Rutte, has responded to the criticism with outright denial. They refuse to let their fond memories be tinged with the hateful epithet of racism. Anger at ‘accusations’ of racism has been running so high that riot police had to be on stand-by for this year’s opening of the festive season. A final note on where this tradition may be going. Because much of the critique has been focusing on blackface in the narrowest sense, there is now a tendency to erase representations of Pete as a brown-skinned man altogether – so not just (belittling) representations by pink actors. In children’s books, for instance, Pete is increasingly pale, and a large Dutch internet company has even completely eliminated Pete from its adverts, now only showing the old white saint. These steps run the danger of replacing a racism of ridicule by a racism of marginalisation. Surely, it is not Pete’s colour which is racist, but the servile and subhuman features of Nicholas’s ‘cheerful little help’ that existing depictions have associated with that colour for so long. This winter in racist Europe, I encountered a popular representation of a dark-skinned man, not as a slave or servant, but as King. 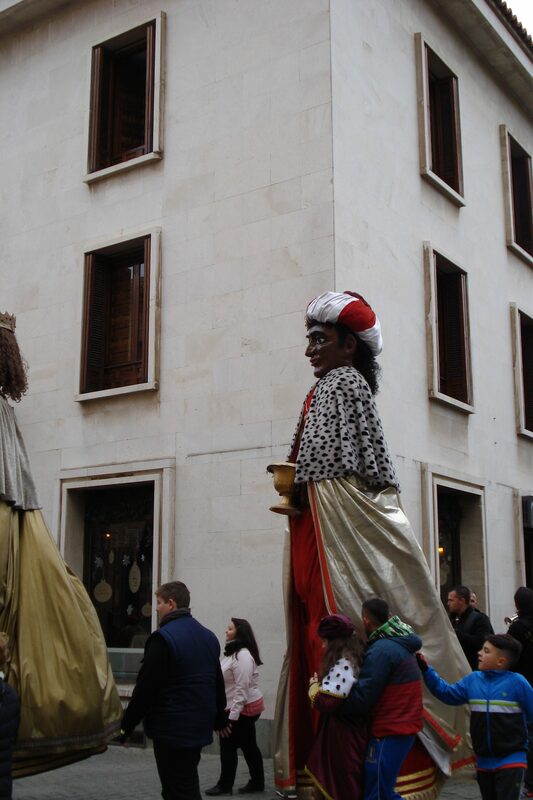 Three Kings celebrations in Alcalá, Spain, January 2016 (photo by the author, CC BY-NC-SA). More on the ancestry of Black Pete can be found in Allison Blakely’s standard work Blacks in the Dutch World: The Evolution of Racial Imagery in a Modern Society (Bloomington, 1993). I was writing an article about the way the fictional character called ‘Black Pete’, part of Dutch winter festivities, is changing under pressure from anti-racism activists, and I came across a cartoon that illustrates the present challenges very well. Briefly, Black Pete’s role is to assist Saint Nicholas on his annual visit to the children of the Netherlands and Belgium. Anyone who likes to know a little more about this character can find it in this earlier post. It is a good thing Black Pete is changing. The concern I have, however, is with the way he is changing. The central problem with the character as he has been portrayed over the past hundred years, is the association of a particular group in society – in this case people with African roots – with a set of negatively valued characteristics – in this case: silliness, clumsiness, docility, and interchangeability. To explain this last point: hundreds of figures are all called ‘Pete’, and if one is absent, another simply takes his place. The association that chains this group of people to this set of characteristics has been fabricated by European colonisers, European-American plantation owners, and similar ‘white’ groups around the world to help justify slavery, colonial exploitation, and paternalistic re-education. Obviously, this chain needed to be broken. At the moment however, this oppressive chain is still personified in the figure of Pete. Yet many people are attached to Pete, and would like to keep him as part of their winter festivities. So the challenge is to create a new Pete – which may also entail creating a new Saint Nicholas – in which this racist chain is broken. Therefore, one of these two things needs to change: either Pete’s identity as someone with African roots, or Pete’s presentation as a silly, clumsy, docile and interchangeable person. Most producers of Pete & Nicholas plays and images in the Netherlands so far, have been opting for the former: Pete has been growing increasingly pale. Yet I think we should seriously consider the second option (this is what I argued in an article in Dutch newspaper Trouw). But, you might say: the locals in this cartoon are not Black, they are blue! Yet does that remove the racism from this cartoon? Does removing the Black from Black Pete really solve the issue?